The Rayleigh number is a dimensionless number, named after Lord Rayleigh. 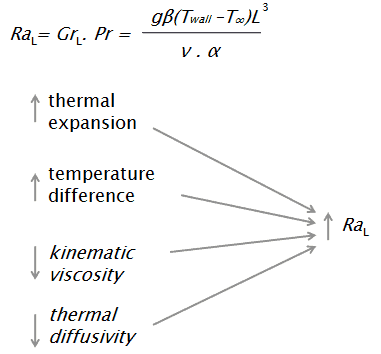 The Rayleigh number is closely related to Grashof number and both numbers are used to decribe natural convection (Gr) and heat transfer by natural convection (Ra). The Rayleigh number is simply defined as the product of the Grashof number, which describes the relationship between buoyancy and viscosity within a fluid, and the Prandtl number, which describes the relationship between momentum diffusivity and thermal diffusivity. The Grashof number is defined as the ratio of the buoyant to viscous force acting on a fluid in the velocity boundary layer. Its role in natural convection is much the same as that of the Reynolds number in forced convection. Natural convection occurs if this motion and mixing is caused by density variations resulting from temperature differences within the fluid. Usually the density decreases due to an increase in temperature and causes the fluid to rise. This motion is caused by the buoyant force. The major force that resists the motion is the viscous force. The Grashof number is a way to quantify the opposing forces. The values of the constants C and n depend on the geometry of the surface and the flow regime, which is characterized by the range of the Rayleigh number. 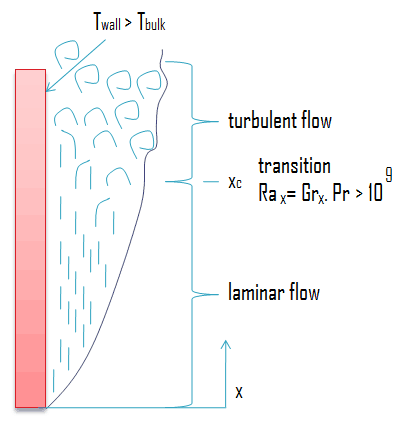 The value of n is usually n = 1/4 for laminar flow and n = 1/3 for turbulent flow. As in forced convection the microspic nature of flow and convection correlations are distinctly different in the laminar and turbulent regions. A vertical plate is maintained at 50°C in 20°C air. Determine the height at which the boundary layer will turn turbulent if turbulence sets in at Ra = Gr.Pr = 109.